$40 | Tours every 15 minutes starting at 4:30 p.m. and last approximately one hour and 45 minutes. During Truckee’s heyday, murders were not uncommon. Though the spirits that still roam the streets are not all suffering souls, there are a few restless phantoms of the night. In years past, they’ve been known to creep up from behind when least expected. Designed to tap your senses and satiate your desire for fun, Truckee’s Historical Haunted Tour is a fundraiser for Trails & Vistas, a nonprofit organization that sponsors fieldtrips for third grade students and produces an annual September art hike that incorporates music, art and dance. 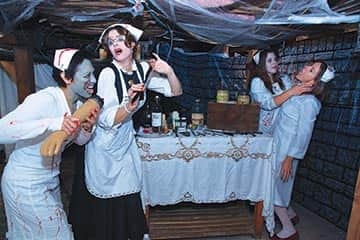 If you’re lucky enough to score tickets for this adults-only event that usually sells out, you are in for a treat with captivating skits inspired by legends of yore at seven featured haunts that are all within walking distance of Moody’s Bistro, Bar and Beats. Saddle up to the bar at Moody’s and keep your eyes wide open for the Lady in Red. Deceased at the hands of her husband, she frequents the bar every now and then and you just might catch a glimpse of her. “After a one-year hiatus, this year’s highly anticipated performances will take place in new featured haunts including Bluestone Jewelry, LaGalleria and Tahoe Oil and Spice, while returning to previous favorites including BeSpoke, Masonic Lodge 200, The Truckee Hotel and The Railroad Depot,” shares event producer Christina Stoever-Young of Sunshine Tahoe, a business designed to enhance partnerships, strengthen exposure and inspire creativity. With a creative flair based on, but not necessarily deeply rooted in, fact, characters and historic tales come to life through songs, dances and entertaining dialogue. People from as far away as Connecticut, Florida, Minnesota, Nebraska, South Dakota and Arizona join Nevada and California residents for a rip-roaring good time in Truckee. Expect to weave in and out of historic sites as this year’s theme, guarded by only those who need to know, links the saloons, stories and brothels of yesteryear. Truckee, past and present, is tied to the tracks laid through town so long ago. Some things haven’t changed – rents were outrageous, one saloon paying a rental of $500 a month nearly 100 ago, and for many, money was plentiful. After all, Truckee attracted those looking for a good time and was known all over the West for a bustling lumber industry, transcontinental railroad, icehouses and red light district. “There would be many years of work for hardworking lumber, ice and railroad workers – who made more than enough cash to enjoy town employing the ladies of the night … It is said you can still hear headboards going ‘Ji-boom, Ji-boom, Ji-boom,’ ” shares one of the guides from the tour’s script. Though fires swept through buildings, the flames did not keep rowdy folks away. All species of vice flourished back in the day. The lawlessness gave birth to the “601,” an organization formed to purge undesirables. Members of the 601 would sometimes break prisoners out of jail to bring them to Hooligan Rock where they would threaten the criminals, sometimes even tar and feathering their victims, before pushing them out of town. What, you wonder, does 601 stand for? Six feet under, zero tolerances and one bullet. Chances are high you will hear their gunshots on Oct. 16 and 17. The KidZone Museum is offering a Not So Haunted Night at the Museum from 5:30 to 8:30 p.m. on Oct. 17 offering childcare with pizza, art and activities for ages 3 to 6. The cost is $30 per child and $25 per child for Tour attendees. Additional siblings are $10 each. Kids are encouraged to come in costume. To make a reservation, call (530) 587-5437. The Historical Haunted Tour began as a three-year experiment by Sunshine Tahoe to celebrate Truckee’s historic gems while raising funds for worthy causes. The event quickly became a sensation, selling out and attracting a waitlist list every year since inception. “The Tour is a creative fundraising event that celebrates local legends and history with highly entertaining and spooky twists. And, we’ve raised more than $31,000 over the years,” explains Stoever-Young, who attributes the success to the world-class acting talent, generous volunteers and business sponsors. Moody’s doors are open for business. Join the cast of characters on the nights of the infamous Historical Haunted Tour. I dare you. For more information or to get your tickets while there’s still time, visit truckeehistorytour.org. Tickets include a complimentary glass of wine from Moody’s and a keepsake and gift certificate to Squeeze In. For a video on the tour, visit vimeo.com/105266757. Guests from near and far will take to the streets of Truckee, CA for the fifth adults-only Historical Haunted Tour on Thursday, October 16 and Friday, October 17, 2014. During the walking tour, a creative fundraising event that celebrates local legends and history with highly entertaining and spooky twists, small groups of residents and visitors are guided to interesting sites where they will be immersed in engaging tales performed by talented characters. The tour skillfully weaves together dramatic, downright haunting and laugh-out-loud funny stories inspired by times of yore. Event producer Christina Stoever-Young of Sunshine Tahoe attributes much of the Tour’s success to the incredible dedication of local business owners and managers and the world-class talent offered by all of the dedicated volunteers. The Tour began as a three-year experiment to celebrate Truckee’s historic gems and attract business to town during a historically quiet time while also raising funds for worthy causes. The event quickly became a sensation, selling out and attracting a waitlist list every year since inception. 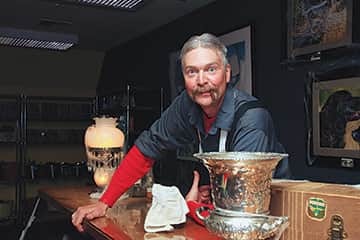 Local businesses contribute to a treasure-packed raffle that celebrates unique work by Truckee-based artisans and travel packages featuring lodging, dining and specials from the event’s sponsors – The Truckee Hotel, Hampton Inn & Suites Truckee Tahoe and Moody’s Bistro. People can secure a private tour with one of six exclusive VIP Tours ($1,000). The exclusive tours include wine, raffle tickets and a special guide for up to 16 people. The Tour’s profits will support Trails & Vistas’ youth-focused art hikes and operations. Individual tickets will be sold for $40 on July 1 at TruckeeHistoryTour.com. To be among the first to know when tickets become available, register at st.sunshinetahoe.website.staging.kps3.com/contact. Will you be among the lucky first to book an exclusive private tour for October 16 or 17, 2014? Treat your clients, staff or family! Or bring together ten of your favorite people for $100 each for a fabulous night to remember in historic downtown Truckee. Everyone will receive a glass of wine or non alcoholic beverage at Moody’s Bistro, two raffle tickets each and an unforgettable night on the town while supporting arts in nature for third grade students. Your private group will depart from Moody’s for a thrilling adventure through historic downtown Truckee. Along the way, entertainers will transport you to a bygone era of our celebrated railroad town. Expect spooky tales, tantalizing scandals and racy stories. The Historical Haunted Tour has consistently sold-out. We hit an all time high in 2012 when the tour entertained 430 people and boasted a wait list of more than 100. We believe this year’s VIP experience will be no different. Secure your date and time while available. On Monday, Feb. 10, the general public will have the opportunity to book a VIP Tour. Every one attending the tour must be at least 21 years of age (IDs will be checked). Sunshine Tahoe is now casting volunteers for Truckee’s 2014 Historic Haunted Tour. The Tour will take place on Thursday, Oct. 16 and Friday, Oct. 17. Looking for volunteer actors, performers and storytellers to bring Truckee’s vibrant past to life in the 2014 Historic Haunted Tour! If you can engage an audience and enjoy playing with people, if history and the arts are important to you and if you want to have a rip-roaring good and spooky time, this is a gig for you! Take advantage of this wonderful and outrageously fun opportunity to showcase your talents. Submit your resume (or a few words about yourself) plus a headshot with “HHTCasting” in the subject line to kira@catanzarocreations.com by Feb. 25. Include a brief statement about why the Tour needs you. Actors must be at least 21 years old. Apply to be one of the five main Haunts – Applications are available by e-mail ($500 cash or in-kind sponsorship). Underwrite two field trip art performers / artists, $600. Host Sponsor – Filled by Moody’s Bistro Bar & Beats! Design – Filled by Atypical Design! Recognition on Tour web site and in marketing material including media releases plus the good feeling that comes from supporting local arts, culture and youth! Funds raised through the Tour will provide Trails & Vistas signature youth art hikes for more than 300 third grade students from Truckee, North Lake and Incline Village as well as support Trails & Vistas operations. $16,000 Raised, Over 400 Spooked! Sold out four years in a row, Truckee’s Historical Haunted Tour has raised more than $31,000 total for Trails & Vistas and the Truckee Donner Historical Society since 2009. The Historical Haunted Tour began as an experiment by Sunshine Tahoe to support two nonprofit organizations and give an economic boost to historic Truckee during the traditionally slow month of October. It has proven to be a successful fundraising initiative and favorite annual activity. In 2009, 70 tickets were available – the tour sold out three weeks in advance. In 2010, 140 tickets were offered. Once again the tour sold out weeks in advance. In 2011, every resource was stretched to the max, and more than 290 tickets were sold. This year more than 400 people from near and far attended the guided walking tour and enjoyed wine at Moody’s Bistro, Bar & Beats! • Haunts: Downtown Mountain Home Center, Coffeebar, MOBO Law, Scraps Dog Bakery, Old Jail Museum and The Pour House. “We captivate a crowd with engaging stories about Truckee,” shares event producer Christina Stoever-Young of Sunshine Tahoe who attributes the tour’s success to the incredible talent and dedication offered by all of the volunteers and sponsors. Pre event coverage contributed to another sold out event. Thank you to all of the Tour’s media partners – The Weekly, Moonshine Ink, Sierra Sun and Tahoe Truckee Radio – and everyone who found this news worth covering! Special thanks to Sac Bee, 7 x 7, Cap Radio, Tahoe Culture and LifestyleandCharity.com. The Historical Haunted Tour, produced by Sunshine Tahoe, is an annual fundraiser that celebrates local history with a fun and spooky twist. The script skillfully weaves together previously untold stories from the past with dramatic twists and new haunts every year. Sunshine Tahoe attribute the Tour’s success and popularity to engaging storytelling and high quality performances plus generous community support. Sponsorship, ticket sales and raffle revenue offer the nonprofit beneficiaries operating revenue for field trips, arts and historic preservation. For more information visit truckeehistorytour.com or call Sunshine Tahoe at (775) 527-4485. Photo credit – Rob Retting, visit our online image gallery @ Rob Retting Images.